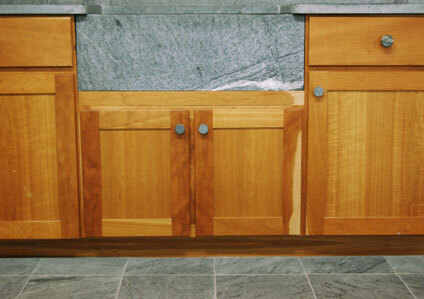 Soapstone is an excellent choice for countertops. While soapstone has been used for laboratory countertops for years, this rustic stone is currently being rediscovered by homeowners who appreciate its good looks and durability. 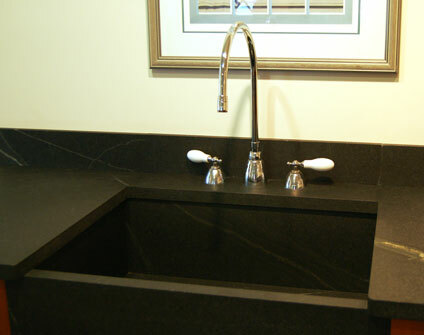 Soapstone countertops can have either an old-fashioned, New England look, or a fresh contemporary appearance. If contrasted with light color cabinets, the resulting kitchen style can look quite striking. Or pair soapstone countertops with a soapstone farmhouse sink and backsplash, and rout the countertop to make an integral drainboard. Choose it for the surface on your island. Whatever your design, soapstone can fit into your busy family's lifestyle. Soapstone is a quarried stone. It has a smooth surface that feels like a bar of dry soap — thus, it is called soapstone. Just as with any natural stone, soapstone will have variations and veining. It is naturally a light gray color which oxidizes to dark charcoal after it's cut. If mineral oil is applied, the color will turn even darker. Soapstone can be fabricated with a variety of edge treatments and finishes. It can be cut and finished with conventional masonry and wood tools, unlike most other natural stone materials. Traditionally, soapstone has been used over the years for tools, dishes, cookware, etc. 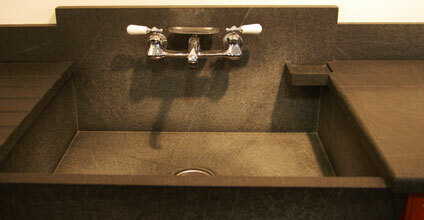 Sinks and shower surrounds and bases are also made of soapstone. Because of soapstone's heat retaining capabilities, it is often used for pizza ovens, fireplaces and stoves. It will retain and radiate the heat for hours after the fire is out. 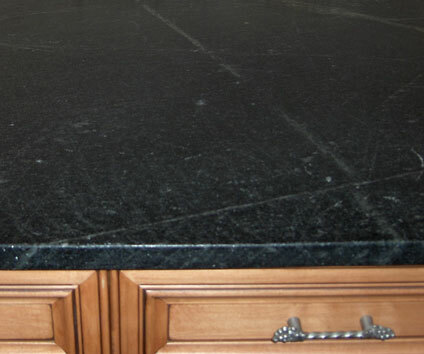 If you're looking for gray or black natural stone countertops, soapstone is a good choice. It is nonporous, so stains can be scrubbed off. The surface finish is resistant to water and acid, and it's not damaged by heat. Scratches can appear over time, but they can be sanded out. A coat of mineral oil will renew the surface and enhance the stone's gray color. The surface may also be left natural and it will darken over time to a charcoal gray color. Clean soapstone with kitchen detergent and warm water. Browse the following websites to learn about these trendy countertops. They will provide you with sources for the stone, as well as how to install and care for it. The Vermont Marble, Granite, Slate & Soapstone Company supplies natural stone quarried from Vermont and other locations. Vermont Soapstone is the original miner, importer, and fabricator for soapstone in America. Soapstone is their only product. M. Teixeira Soapstone supplies quality soapstone from around the world. They can fabricate and install the soapstone, or supply the raw stone. Based in Perkasie, Pennsylvania, the Bucks County Soapstone Company provides soapstone countertops and sinks in many styles and sizes. Countertop Materials reviews the characteristics of popular kitchen counter materials.